Shown here: harveys 6, September 24, 2006. Piece by Apex. Catching up on some long-running classics: the wall at Harvey’s in SoMa has some fresh paint on it. 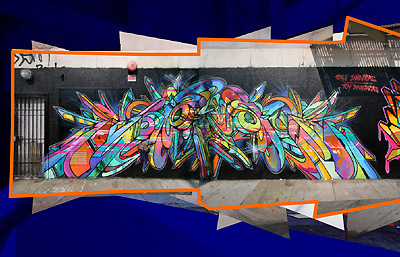 Two new layers, from 2005 and 2006, featuring work by APEX, JASE, NEON BA, plus CHORBOOGIE, PARISYTE, BLATE, and more. Follow the link above, and select “harveys/north” from the menu to see the new stuff.